I am learning quickly how to do this - working on my "circle" scarf - but at the same time figuring out that the back is ugly. I have figured out that the bobbin things aren't really necessary - it's easy to make a "figure 8" loop of yarn and twist it together to hold the yarn together - it also pulls out of the center and seems to be working well. the little ball of yarn fits good in my hand when I'm knitting using that particular color too! I'm freaking out a little about the way it looks on the back - I think I will end up making two of these scarves (wishful thinking since this is difficult for me) and just stitch them together somehow - the biggest problem would be that I only have enough of my main color to do one scarf - I guess it's not that bad though - I can always use a second color for the back - one of the colors from the other side of the scarf. I talked with the guys on menwhoknit.com and they had some suggestions about how to keep the back as tidy as possible - I think once some of the ends are woven in it won't be THAT bad... - the good news is that the circles are actually looking like circles! not to shabby for a boy who hasn't really done much of this colorwork stuff! I stick to fair isle. I'm never satisfied with how intarsia looks when i do it. 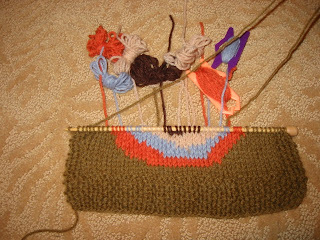 No, as you have learned, intarsia is a one-sided thing. Ever look inside a sweater done in intarsia? Unless you can do double-layer knitting, with another "face" on the back, you are going to have the under-workings showing. That's how it is! 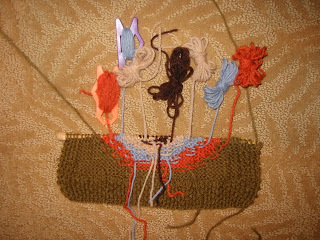 If you are planning on doing another scarf to stitch on the other side, you don't have to use the same colours, you know! You can use whatever you have left, and also use some complimentary colours if you don't have enough of the background, and in another pattern. That way, you get TWO scarfs out of one. Good deal, I think.